This AZ Petrified Wood polished round measures 10 3/4 x 8 x 5/8 of an inch. It has a small chip on the face. Stand not included.Please email for shipping and handling charges. This AZ Petrified Wood polished round measures 12 x 11 x 5/8 of an inch. It has a small chip. Stand not included.Please email for shipping and handling charges. This AZ Petrified Wood polished round measures 14 x 11 1/4 x 3/4 of an inch. Stand not included.Please email for shipping and handling charges. This AZ Petrified Wood polished round measures 13 3/4 x 10 3/4 x 1/2 of an inch. Stand not included.Please email for shipping and handling charges. AZ Petrified Wood polished round measures 15 x 12 x 1/2 of an inch. Stand not included.Please email for shipping and handling charges. This AZ Petrified Wood polished round measures 12 x 10 x 5/8 of an inch. It is missing some bark. Stand not included.Please email for shipping and handling charges. 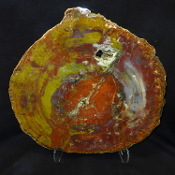 This AZ Petrified Wood polished round measures 16 1/2 x 16 x 1 inches. Stand not included.Please email for shipping and handling charges. 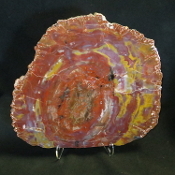 This AZ Petrified Wood polished round measures 14 1/2 x 13 1/2 x 1 inches. Stand not included.Please email for shipping and handling charges. This AZ Petrified Wood polished round measures 16 1/4 x 16 x 1 inches. Stand not included.Please email for shipping and handling charges. This AZ Petrified Wood polished round measures 20 3/4 x 15 3/8 x 1 inches. Stand not included.Please email for shipping and handling charges. 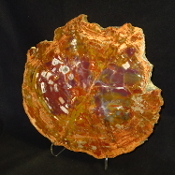 This AZ Petrified Wood polished round measures 20 1/2 x 13 1/4 inches.Thickness varies from 7/8 to 1/2 an inch. Stand not included.Please email for shipping and handling charges. This AZ Petrified Wood polished round measures 17 1/4 x 15 x 1 1/8 inches. Stand not included.Please email for shipping and handling charges. 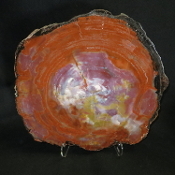 This AZ Petrified Wood polished round measures 18 x 14 1/4 x 3/4 inches. Stand not included. This piece has been discounted due to flaws. Please email for shipping and handling charges. This AZ Petrified Wood polished round measures 16 3/8 x 16 x 1 inch. Stand not included.Please email for shipping and handling charges. This AZ Petrified Wood polished round measures 19 x 15 1/4 x 7/8 inches. It has a beautiful smokey quartz pocket on the face. Stand not included.Please email for shipping and handling charges. This AZ Petrified Wood polished round measures 20 1/2 x 13 x 7/8 inches. Stand not included.Please email for shipping and handling charges. This AZ Petrified Wood polished round measures 16 3/4 x 12 1/2 x 7/8 inches. Stand not included.Please email for shipping and handling charges. This AZ Petrified Wood polished round measures 20 x 15 3/4 x 1 inch. Stand not included.Please email for shipping and handling charges. This AZ Petrified Wood polished round measures 20 1/2 x 14 1/2 x 1 inch. Stand not included.Please email for shipping and handling charges. 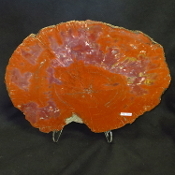 This AZ Petrified Wood table top measures 14 1/4 x 11 1/4 x 3/4 inch. Stand not included. Please email for shipping and handling charges. This AZ Petrified Wood table top measures 17 x 15 x 1 inch. Stand not included. Please email for shipping and handling charges. This AZ Petrified Wood table top measures 16 x 15 1/4 1 inch. Stand not included. Please email for shipping and handling charges. This AZ Petrified Wood polished Round measures 17 3/8 x 13 x 1 inch. Stand not included.Please email for shipping and handling charges. This AZ Petrified Wood polished round measures 17 5/8 x 17 5/8 x 7/8 inches. Stand not included. It has crystal pockets on the face. It has been discounted due to flaws. Please email for shipping and handling charges. This polished round measures 16 x 16 x 1 inch. Stand not included.Please email for shipping and handling charges. This AZ Petrified Wood polished round measures 16 1/4 x 13 5/8 x 7/8 inches. Stand not included.Please email for shipping and handling charges. This AZ Petrified Wood polished round measures 18 3/4 x 15 5/8 x 3/4 inches at thickest point. Stand not included.Please email for shipping and handling charges. This AZ Petrified Wood polished round measures 15 1/8 x 15 3/8 x 1 inch. Stand not included.Please email for shipping and handling charges. This AZ Petrified Wood polished round measures 16 x 14 x 1 inch. Stand not included.Please email for shipping and handling charges. This AZ Petrified Wood polished round measures 15 x 18 x 1 inch. Stand sold separatley.Please email for shipping and handling charges. This AZ Petrified Wood polished round measures 17 3/8 x 13 1/4 x 7/8 inches. There are a few minor facial flaws. Stand not included.Please email for shipping and handling charges. This AZ Petrified Wood polished round measures 18 x 15 x 1 1/2 inches. Stand not included.Please email for shipping and handling charges. This AZ Petrified Wood polished round measures 18 x 15 x 1 inch. Stand not included.Please email for shipping and handling charges. This AZ Petrified Wood polished round measures 17 5/8 x 16 x 1 1/8 inches. Stand not included.Please email for shipping and handling charges. This AZ Petrified Wood polished round measures 16 5/8 x 15 x 7/8 inches. Stand not included.Please email for shipping and handling charges. This AZ Petrified Wood polished round measures 18 1/4 x 14 3/4 x 3/4 inches. Stand not included. Please email for shipping and handling charges. This AZ Petrified Wood polished round measures 15 3/4 x 13 1/2 x 1 inch. Stand not included. Please email for shipping and handling charges. This AZ Petrified Wood polished round measures 15 3/4 x 14 x 7/8 inches. Stand not included. Please email for shipping and handling charges. This AZ Petrified Wood polished round measures 17 3/4 x 16 x 1 inch. Stand not included.Please email for shipping and handling charges. This AZ Petrified Wood polished round measures 18 1/4 x 15 x 1 inch. Stand not included. Please email for shipping and handling charges. This AZ Petrified Wood polished round measures 17 1/2 x 13 x 1 inches. Stand not included. Please email for shipping and handling charges. This AZ Petrified Wood polished round measures 17 1/4 x 12 3/4 x 3/4 inches. Stand not included. Please email for shipping and handling charges. This Polished Round measures 16 x 15 1/4 x 1 inch. Stand not included. Please email for shipping and handling charges. This polished round measures 17 1/2 x 15 1/2 x 1 inch. Stand not included. Please email for shipping and handling charges. This polished round measures 18 1/2 x 16 x 1 inch. Stand not included. Please email for shipping and handling charges. This polished round measures 19 x 15 x 1 1/4 inches. Stand not included. Please email for shipping and handling charges. 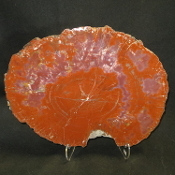 This polished round measures 19 x 14 3/4 inches across the face. The width goes from 1 inch down to less than 1/3 inches. Stand not included. Please email for shipping and handling charges. This polished round measures 19 x 15 x 1 inch. Stand not included. Please email for shipping and handling charges.